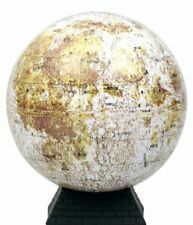 CG Colour In Cork Globe 6 Inch Desktop Globe Explore Travel Enjoy New! US Plug Power adapter 1. Perfect as gift to your friends. Made of good quality material, durable to use. Fashion and Cool Design. Convenient and easy to use. Color: Silver Black. A simple yet informative and educational desktop world globe beautifully arranged in a spectrum of vivid colors. Ocean Color :- White. The globe is constructed from durable ABS Plastic Materials. With Precise location scale on surface. Material: Glass plastic. Note: Light shooting and different displays may cause the color of the item in the picture a little different from the real thing. Color: transparent. The object to float and display is not ok if is over 250gs. This magnetic Display Base device must be 30 cm far away from othr electronic devices, such as phone, computer or others. 4 white accent LEDs spotlights your item beautifully. Type: Rotating LED Light. Swivel Globe encourages inquisitive children to explore and think big. Kitchen & Bar Supplies. Research all the regions of the world with the globe. Map View: World. Special design, with LED Light. 1 x Magnetic Floating Globe. Easy to install, the globe can get floating very easily. Globe & Light Color: Blue & Color, Gold & Color, Blue & White, Gold & White. 10.6cm/ 4.17". Detail Image. This product is convenient and easy to use. Research all the regions of the world with the globe. 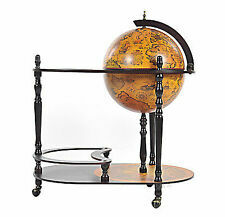 1 x World Globe Atlas Map With Swivel Stand. Swivel globe encourages inquisitive children to explore and think big. 14cm/ 5.51". Detail Image. If not, the globe can not levitate normally. -Creative and unique: floating and rotating in mid-air with colored LED light, lighting up your life. Warm prompt -Working principle: it works with an electromagnet and computerized sensor hidden in its display stand causing it to levitate motionlessly in the air. It is painstakingly handcrafted by the most talented artists by, using more than 30 different semi-precious gemstones from all over the world! This is a huge amount of striking and dramatic hand-crafted stone work. 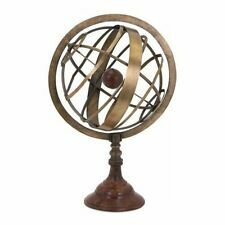 Blue Wonder Earth Rotating Globe 2001 Replogle "Patent Pending" Plastic Stand 6"
Load-bearing: 500g. Reminder: cardboard in black magnet covering the surface of certain hardness of wood, need to be suspended in the process of plastic plate, to prevent the suspension after the failure, smashed the circuit board or magnet suspension magnet. A simple, yet informative and educational desktop world globe beautifully arranged in a spectrum of vivid colors. Expand your perspective and enhance your knowledge of our earth and its geography. 1 x Electric World Globe. 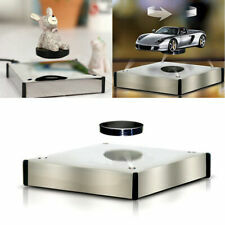 1 x Magnetic Levitation Floating Globe. -Floating in mid-air, with colored LED light to make it graced in the dark when turned on. -The magnetic above the gadget contains an electro magnet and a magnetic field sensor. Condition Issues: Globe spins properly. Two chipped corners on base as seen in images. NEW 60mm Small LAPIS Blue GEMSTONE. 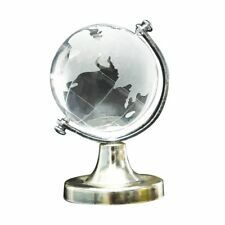 GLOBE World Map Desk Tabletop w/ Gift Box. 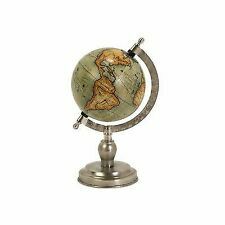 2.4" globe on a 3" rotating stand. Big Rotating Globe World Map of Earth Geography Home Decor Class Learning 12.5"
32 cm Swivel Globe encourages inquisitive children to explore and think big. Type: Rotating. 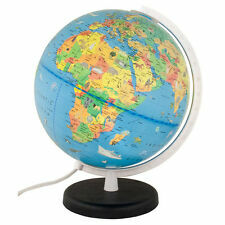 Research all the regions of the world with the globe. Map View: World. - Due to the different display and different light, the picture may not reflect the actual color of the item. Dark yellow map with English letters, retro nostalgia. 1 x World Globe. Globe can be rotated around, can also flip up and down, easy to read and browse. The map is beautifully printed and the text is clear and works fine. 1 x Display stand(19.5 5cm). 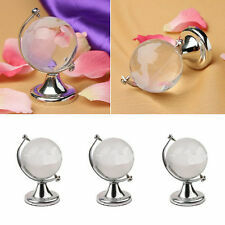 1 Pc World Globe Crystal Glass Clear Paperweight Desk Decor Wedding Favor S1 New. -Glittering and translucent. Color：transparent. -With Precise location scale on surface. Material：Glass plastic. We will try our best to reduce the risk of the custom duties. 1 x Automatic Rotating World Globe. With only one battery, it can rotating automatically. Teaching toys, children's toys globe. Ideal for your living room, study room, office or conference room. Material: Plastic(body), PVC(map), Acrylic(sphere support).